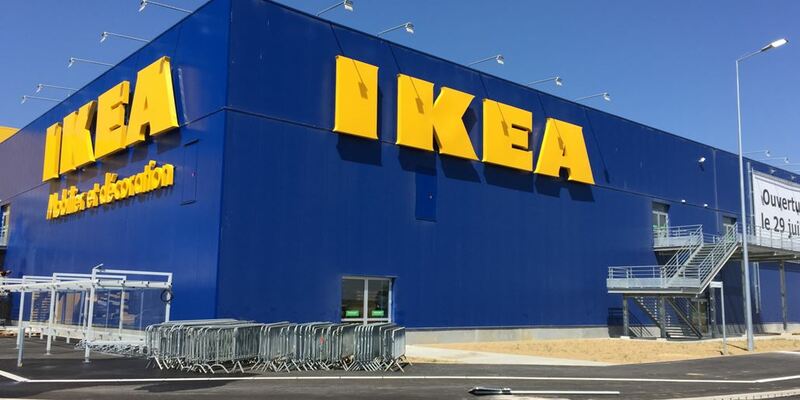 For over a decade, IKEA has held the title of the world’s largest and most successful furniture retailer. And if you have ever stepped foot in an IKEA department store, you can probably guess why. Their chic, high-quality products combine with their affordable prices to provide unmatched value for their customers, and their wide variety of mattresses are no exception. When you order a mattress online from an ecommerce store, or if you buy one from a questionable discount furniture store, you run the risk of not finding the right match for you. Likewise, you also accept the risk that you might not be able to return the protect or it may be prohibitively expensive to do so. This isn’t the case with IKEA. Buying a mattress from IKEA takes all the stress and uncertainty out of mattress shopping. With a vast selection of mattresses to choose from, and one of the world’s best return policies, mattress shopping at IKEA is risk-free. That’s what makes IKEA one of our favorite one-stop-shops for finding the perfect mattress. Are you looking for the best IKEA mattress to improve your sleep quality and ensure a good night’s sleep every night? If so, we’ve put together a list of IKEA mattress reviews to help you make an informed decision. Read on to find out which mattresses are the best that the Swedish furniture maker has to offer. IKEA was founded in 1943 by Ingvar Kamprad, a young Swedish entrepreneur. Through mail order, the company sold wooden kitchen tables and in 1948 expanded to include a diverse range of furniture. The first IKEA outlet store opened its doors ten years later and began expanding throughout Europe by the late 1960s and throughout the globe in the 1970s. In the 2000s, IKEA became the world’s largest furniture company. 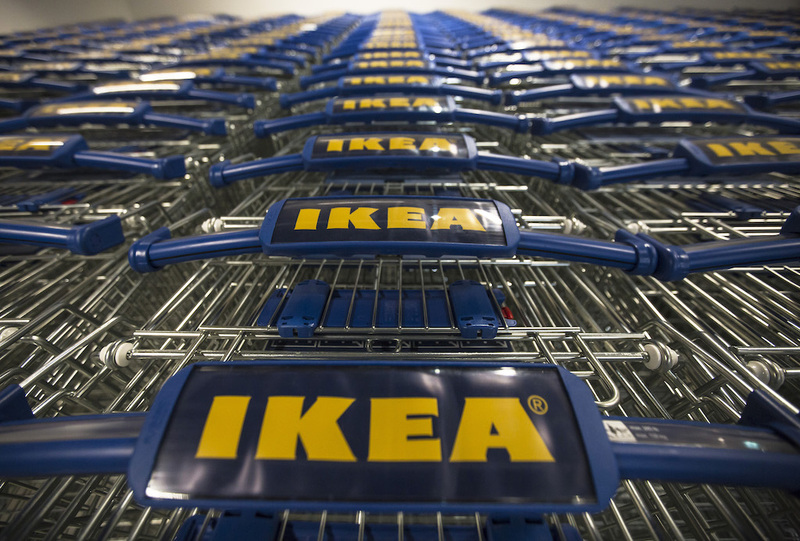 Today, IKEA brings in over 40 billion dollars in annual revenue. Their success is largely due to their penchant for creating chic, modern-looking furniture that is simplistic in appearance, easy to assemble, and eco-friendly. These attributes are found in all IKEA mattresses sold today. What Makes An IKEA Mattress Unique? Unlike at large department stores, IKEA provides a no-pressure environment for mattress shopping. When we shop for mattresses at other big-name vendors, we often find that sales reps attempt to either upsell or purchase or hassle us into buying whatever model the store is trying to liquidate. At IKEA, mattress shopping involves little stress. The store staff are friendly and supportive and are only there to help answer your questions regarding the various models and their assembly process. Aside from buying online (which IKEA also offers), shopping for a mattress at IKEA is as hassle-free as it gets. Plus, buying a mattress at IKEA is a customer-centric process from start to finish. Every IKEA mattress is conveniently rolled and packaged to be easy to carry, maneuver, and transport for the customer. Additionally, they come with an industry-leading 90-night warranty, so that you can test out your new mattress with peace of mind. Now that we know the basics when it comes to IKEA mattress shopping let us move on to our list of IKEA mattress reviews. After viewing each model in store and online and testing out each of them for at least one night, our expert reviewers put together this handy list of the best IKEA mattresses. - Get all-over support and comfort with a resilient foam mattress. 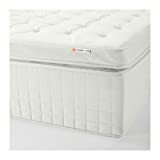 - The mattress is approved for seating, as the zipper is placed on the bottom. 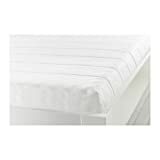 One of IKEA’s many popular budget-friendly foam mattresses, the Minnesund provides exceptional quality for a light, portable mattress pad for kids. Measuring 75 inches in length and 39 inches in width, this mattress is an excellent choice for a child’s bed or for a small futon cover. Although there was a distinct smell when we first removed it from its packaging, it completely wore off by the following day. After calling IKEA customer support about the scent, we learned that this is both a perfectly safe and normal feature of brand new cotton bedding. What we loved most about this mattress was its lightweight build, weighing only 14 pounds. 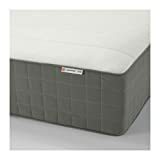 This makes the mattress ideal for taking out of the closet for kids’ sleepovers or if you need to sleep an extra child on the floor when family is over. - Easy to keep clean since you can remove the cover and wash it by machine. - High resilience foam gives support for each part of your body by closely following your movements. - Comfort zones give very precise support and relieve pressure on your shoulders and hips. Available in both firm or medium sleep comfort settings, the Morgedal is an IKEA mattress that provides full-body support at a budget-friendly price point. 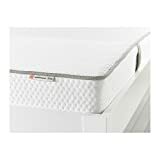 After spending a single night on the Morgedal foam mattress we found that our hips and shoulders felt better than they had in weeks, thanks to the firmness found in the various pressure zones. Finding an affordable, lightweight mattress that also provides adequate support is a real challenge. However, the Morgedal manages to do both to a fair degree. Although it served us well on the occasions that we used it, we would prefer to use something a bit thicker as an everyday sleeper. Nonetheless, the Morgedal is a great choice for a guest mattress. - A generous layer of soft filling adds support and comfort. IKEA’s most affordable memory foam mattress, the Matrand is a comfortable solution without being overbearing or too thick. At 7.5 inches in thickness and 80 inches in length, it is a suitable mattress for smaller adults who value comfort over support. In our experience, it was a bit too absorbing of our every movement during the night. 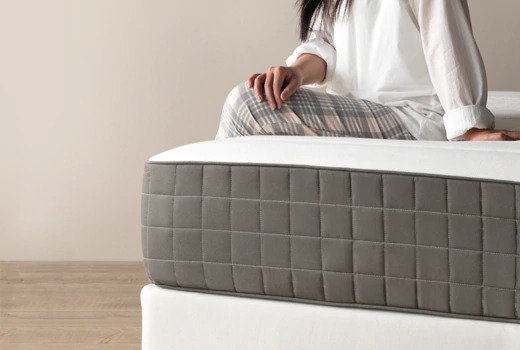 We found that our hips felt great after a full night’s sleep on the Matrand mattress. While we appreciated how soft the memory foam top was, there was a bit of an issue with overheating. But if you live in a cool climate, or have air conditioning and breathable bedding, it is unlikely that you will run into the same issue. - Natural latex helps you to fully relax by contouring your body shape to relieve pressure and provide precise support. - Natural materials like wool and cotton help air flow through the mattress to make sure you don't get too warm or cold. The Foldoy is the mecca of IKEA’s memory foam mattress lineup. From the moment we first unrolled it from its package and pressed our hands on it we knew the Foldoy was special. It is softer to the touch than any other gel infused memory foam mattress and the interior gel helps cool the body throughout the night. 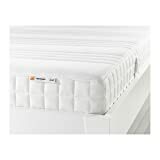 In our experience, the Foldoy ranks among the best IKEA mattresses for supportive and restful sleep. Whether you sleep on your back, stomach, or side, the Foldoy provides maximal comfort and ample support. Typically, we feel sore and tight the next day whenever we fall asleep on our stomachs, but with the Foldoy we noticed no physical soreness at all. The Morgongava mattress from IKEA is one of the few latex-based models in their catalog. Natural wool and latex throughout the mattress help regulate body temperature while you lay on it over time. Not only did this make for a more comfortable sleep, but it also kept us sound asleep throughout the night since overheating is a major sleep disturbance for us. We appreciated how this mattress doesn’t skimp out on providing support where it is needed most. For example, both the shoulders and hips are given plenty of additional firmness to keep these parts of the body align with the rest. At the end of an exhausting day at work, we appreciated being able to freely sprawl about on the bed without worrying about next-day soreness. For maximum value, you would be hard-pressed to find an IKEA mattress better than the Matrand. At roughly half the price of their top-tier mattresses, this latex mattress packs all the firmness and support you would expect from a luxury product. We slept on this mattress for over a week before we had to switch over to the next one. This came as a surprise to us because we only planned on using it for a single night. But after finding out how supportive and firm this mattress was, we could not resist squeezing an extra night or two on it. Our only regret is that we couldn’t keep it around the house longer. - Response coils are individually wrapped to insulate movements so you don't disturb your bed partner. If you want a spring-loaded mattress that won’t break the bank or your back, the Haugsvar might be the choice for you. At a reasonable, mid-range price point, the Haugsvar offers premium value thanks to its many pocket springs underneath the pillow top surface. Ideal for athletes and the elderly, the high-density foam provides much-needed relief for achy bones and joints while also promoting proper blood flow. Plus, movement-isolating coils make sure that your partner won’t be disturbed no matter how often you toss and turn in the night. The spring-loaded, memory foam-topped Holmsbu mattress is about as luxurious as it gets at IKEA. Combining the cooling benefits of gel-infused memory foam and the deep support offered by pocket springs, the Holmsbu is the perfect everyday sleep solution. Our only qualm with this product is that when you get up to the high price point that the Holmsbu finds itself in (i.e., >$1,000 for the king-size), you might find better value elsewhere. After all, IKEA is not known for their competitiveness in the luxury goods market. Instead, high-end department stores might offer a superior alternative. IKEA fares well when compared to rival department store mattress dealers. While their products offer adequate nighttime comfort and support, we would be lying if we said they were superior to other brands like Sealy and Tempur-Pedic in this regard. Instead, IKEA mattresses tend to edge out the competition in two ways: their excellent return policy, and their chic minimalist design. Regarding the latter, IKEA mattresses have a beautiful streamlined appearance that suits any room. By contrast, many department store mattresses are puffed up and are designed to look bulky and lavish. IKEA’s return policy is what makes their mattresses special. With their signature 90-Day Love or Exchange Policy, the good folks over at IKEA allow you to return any mattress with its receipt within 45 days of purchase, as well as an in-store exchange within 90 days. This is the kind of customer-centered treatment you can’t find at rival department stores. Unfortunately, IKEA is not known for their door-crasher sales. Typically, the price of an item remains the same regardless of the time of year at IKEA. At present, there are no coupon codes or discount deals on IKEA mattresses that we know of. After browsing other IKEA mattress reviews online, we found that customers generally have positive things to say about their purchase. And after testing their entire mattress line, from the old-school spring mattresses to the gel infused memory foam pads, we finally understand why. Put simply, IKEA offers quality mattresses at affordable prices backed by great warranties. While there are plenty of reasons why we think IKEA mattresses are a great buy, we also share some reservations about whether they are ideal for everyone. For instance, IKEA appeals mostly to bargain hunters and those looking to get the most out of their money. However, we recognize that some shoppers may find a more appropriate mattress at a luxurious furniture outlet. For a reliable, long-lasting mattress in the low to mid-tier price range (i.e., in the $800 range and below), we strongly recommend browsing the selection at IKEA. 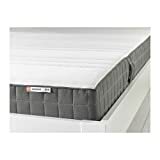 To find the right mattress model for your individual needs, we encourage you to read over our IKEA mattress reviews again.